The much criticized grip of the A230/A330/A380 series is gone, and replaced with a more conventional and apparently with much better ergonomic. The Smart Teleconverter button is moved out of the way a little, up onto the camera top. 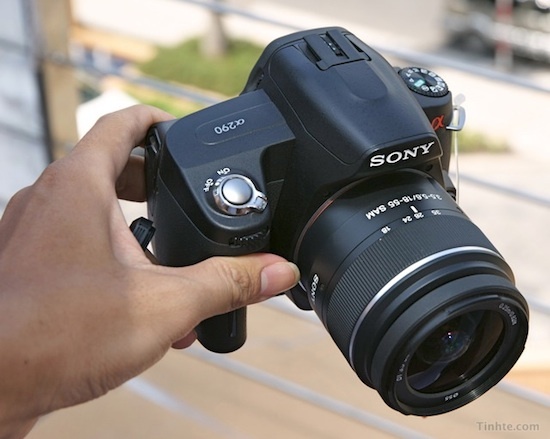 Resolution of the low end model is increased with 40%, so now both are equipped with 14 Mp image sensors. Couldn't find any mention of it being CCD or CMOS, but have made a quick browse only so far. And A390 has Quick LiveView, while A290 has not (thanks Sony, for not confuse us unnecessarily!). There will also be dual kits with the 55-200 mm too. Either Memory Stick or SD memory cards (no dual slot, but a single combo slot). New Help Guide + Tip Function (very clever, says the magazine writer). This entry was posted in Sony and tagged Sony a290, Sony a390. Bookmark the permalink. Trackbacks are closed, but you can post a comment.